– the sports nerd | brainsnorts inc. Remember that kid in school who knew every player at every position on the Yankees but didn’t know how to hold a bat, didn’t have his own glove, and threw like a – well, like someone who couldn’t throw? I hated those kids. It was wrong to hate them because it wasn’t their fault, but I still hated them, probably because they were always telling you what you were doing wrong but had no clue how to actually do it themselves. Bill Simmons of ESPN is one of those guys. All you need to do is hear his voice and you’ll know it. 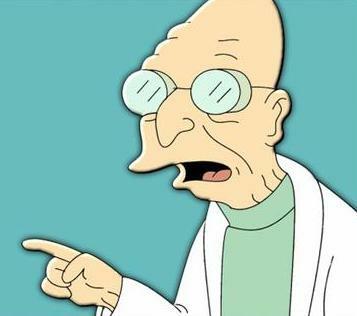 He’s a cross between Hubert Farnsworth of Futurama and Charlie from The Simpsons. Even if what he has to say is accurate, he still sounds like he should be batting 10th on a 9-man roster. Back around 2000 I used to read his column called “The Sports Guy” in ESPN the Magazine, which has fabulous photography but its stories are worthless. The old “Sports Guy” columns were funny because he explored the origins of sports terms and clichés, like why the place where pitchers warm up is called “the bull pen.” It was funny and clever. It wasn’t athletic, but it wasn’t supposed to be. He wasn’t being an athlete, he was being a writer. But now he’s moved up to the real sports media world in which he hosts a show called “The BS Report.” Instead of asking “why is it called a puck?” he’s asking “what’s wrong with the Knicks and how can they return to championship status?” Instead of tell you why we stretch in the 7th inning, he’s telling you who the Celtics should draft. And when he tells you, it’s this annoying voice that grates on you like a poorly struck violin. He’s nothing more than a less outspoken Mike Greenberg, but at least Greenberg actually entered a qualifying tournament for the U.S. Open this year. However, if you’re going to tell me what an athlete or franchise needs to do, I’d rather hear it from Mike Golic or Tim Hasselback, who weren’t very successful on the field, but at least they were ON the field. And while most of this was perhaps an unfair, stereotypical rant, it can be made worse by saying that it’s no surprise that a graduate of Holy Cross who has a III after his name is exactly what we should expect from this type of non-athletic behavior. April 22, 2011 in sports, writing. How About a Little Competition?